Kinmount United Church is an example of an architectural style of the era, known as balloon framing. 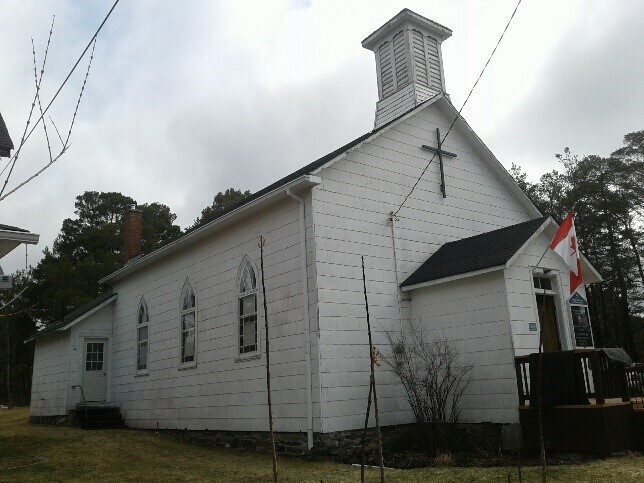 The present day church building was built by volunteers of the Kinmount Presbyterian Church of Scotland in 1867. These volunteers from the congregation used building materials from the local sawmill (Craig and Austin). This simpler framing method made it easier for settlers, farmers, and others, not trained in joinery of timbers, to quickly construct simple dwellings with lumber and nails as opposed to timber frame or braced framed. The Kinmount United Church building reflects this simple construction type. The church sits atop the original stone foundation which was laid in 1866. The main beam of the church is the original beam from its construction in 1867. There is no floor under the church, just sand. The main floor of the church consists of the original wide planks. There have been services in the community for 158 years, using local congregational members’ homes. On September 7th, 1859, Rev. William S. Clark delivered the first service with twenty members in attendance at the home of John Hunter. The church building has held continuous church services for 150 years. This building is the oldest, publically used building in Kinmount and may be the oldest building in the community. 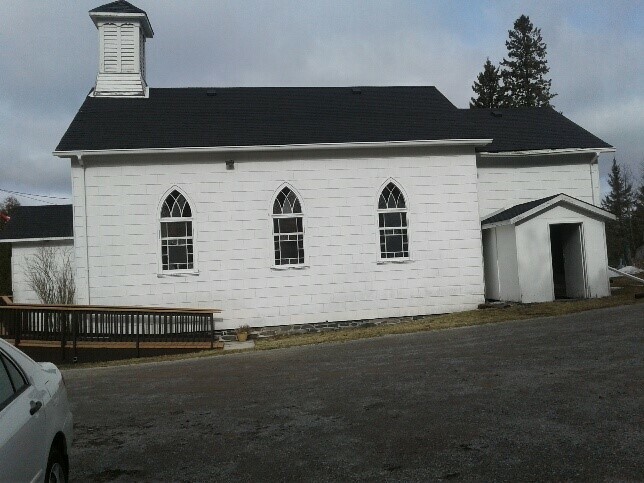 As the first church building in Kinmount, arrangements were made to make use of the only church facility in the community. On Sundays, the Presbyterians and Methodists used it in the morning (at different times) and the Anglicans and Baptists used it in the afternoons (at different times). These denominations also shared summer Sunday school picnics and sporting events together. Information from diaries kept by early ministers, namely Rev. William S. Clark and Malcolm Stanley Lehigh highlight the importance of this church building and its congregation to the early years of Kinmount. Today’s congregation continues to be active within the community through volunteering and participation in local activities and organizations. According to Rev. Clark’s accounts (1861-1876), the family names associated with this first congregation included the following: Dettman, Henderson, Kenettle, Scarlett, Molyneaux, and Butts. Today, descendants of some of these original families can still be found in the area. When the United Church of Canada was formed in 1925, the Presbyterians joined the United Church. The building consequently became the home of the newly formed United Church congregation in Kinmount. The adjacent manse was built in 1898. Kinmount had its own minister until 1950. For the next eight years, the church was served by clergy from Minden as well as supply ministers. On January 1, 1958, Kinmount became part of the Coboconk Pastoral Charge. There were four churches in this charge- Burnt River, Coboconk, Kinmount and Norland. In January 2006, Kinmount United Church became a single pastoral charge and continues this designation today. The Church building was renovated in 1944 and 1978. Interestingly, a manual pump organ, purchased in 1923, is still used occasionally to provide music prior to worship services.